Detroit general manager Ken Holland announced today that team captain Henrik Zetterberg‘s back condition will keep him from returning to play. His career is over and he will ride out the final three years of his contract on long-term injured reserve. The announcement does not come as a surprise, with each update on Zetterberg’s condition over the summer getting progressively worse. While the team will be without its leader, Zetterberg going on LTIR does solve their salary cap situation. Additionally, the team could look to move his contract (or that of Johan Franzen, also “LTIRetired”) to a team that needs to get to the salary cap floor. The Red Wings are not expected to replace Zetterberg as captain this season, instead rolling with three alternate captains. Dylan Larkin will likely wear the third A alongside Justin Abdelkader and Niklas Kronwall. We learned several weeks ago that the Red Wings would be removing the “Hockeytown” logo from center ice at Little Caesars Arena, with the promise of something new to be unveiled down the road. Today was that unveiling, as the Red Wings released an updated “Hockeytown” logo alongside new promotional initiatives for the coming season. The logo was designed by Olympia Entertainment’s creative team in conjunction with Troy, Mich.-based SMZ Advertising. The logo was selected following research collected from fans of all ages and Red Wings season ticket holders. 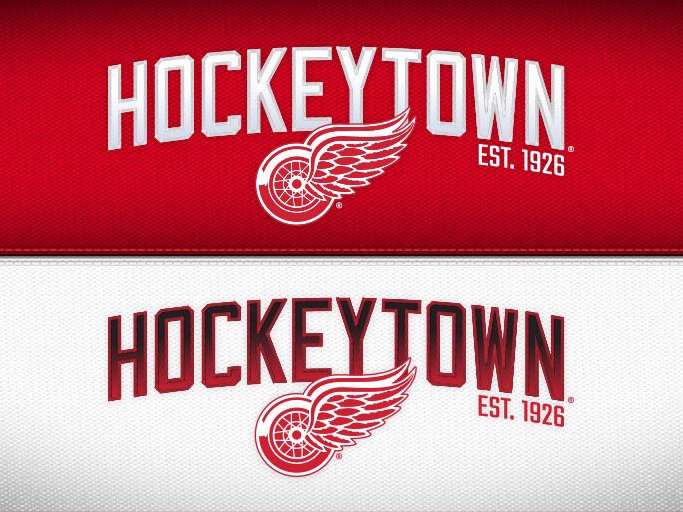 I’m on the record (repeatedly) as disliking the original “Hockeytown” logo. While this is an improvement, it still comes across as extremely lazy to me. As I often said about the original, this one only “says” Hockeytown because the word is literally plastered across the logo. If they were going to make that same mistake again, I would have preferred to see them use the retro-looking “Hockeytown” logo from the west side of LCA. Of course, if Yzerman is leaving Tampa then he has to be coming to Detroit, right? And HSJ confirms this for us. Pertaining to @JoeSmithTB report of Steve Yzerman stepping down as GM in Tampa Bay, source tells Free Press Yzerman told Lightning players he was going home to Detroit. Has maintained area home while GM of Tampa Bay Lightning. But that wording is… Peculiar. So let’s go back to Joe Smith on that take. Yzerman told #TBLightning players he was heading back to Detroit but it was unclear if that meant to live (he has a family and home there) or to eventually work. Okay, that’s a little bit more clear. What we know is that Yzerman is stepping down as GM of the Lightning. We know he has a house and family in Detroit. It sounds like he’s coming back to that house. It sounds like he’s going to spend the remaining year of his contract as an adviser to the Lightning. Which he can do from Michigan, of course. In the meantime, Detroit has GM Ken Holland signed for two more seasons. He could always be fired or moved into another position and just get paid to go away, so that contract doesn’t mean too much. It is worth noting, though, that Holland refused to step aside and allow Yzerman to take over his role back in 2010, leading to Yzerman leaving for Tampa. The big question for me is timing. I can understand Yzerman leaving the Lightning. I can even understand him leaving the Lightning for the Red Wings. I can’t understand why the eve of training camp is when he would choose to do it. In talking to GMs, people are surprised by Yzerman news but reserving comment until they find out the details. I was already concerned that this isn’t a professional move and that his return to Detroit is for personal reasons. Pure conjecture on my part. But that the GM community is surprised by this might lend credence to the idea. The press conference announcing the move is at 4:00 PM today, so maybe we’ll know more then. I mentioned this on Twitter earlier today but figured it’s worth a quick post here. 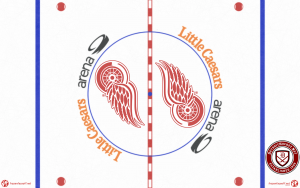 We found out two weeks ago that the Red Wings would be removing their “Hockeytown” logo from center ice at Little Caesars Arena. At the time, center ice on the team’s practice rink still used that logo. Today, however, we got the first look at that facility’s Hockeytown-less neutral zone. As I said two weeks ago, I’m absolutely fine with the Hockeytown logo being removed. Seeing the updated practice rink, however, inspired me to draw up what I actually want to see the Red Wings use. A proposed center ice design for Little Caesars Arena. Note: Center ice template and base artwork courtesy Frozen Faceoff. For reference, see their actual 2019 design. The Little Caesars Arena wordmark is awkward under the best circumstances, as it attempts to blend the serifed, outdated Little Caesars text with a sans-serif, lowercase font for “arena” (followed by the arena logo itself). Having that wordmark straddle the red line makes it worse. To fix this, I take the “top” version of the arena wordmark, spin it 90 degrees, then copy that (rotated 180 degrees) to the opposite side of the faceoff circle. All last season I found the “Little Caesars” text to be distracting, as it’s the brightest thing on the ice at LCA, and my change could help with that by having those two orange blobs of text on opposite sides of the circle. Inside the circle I go with dual Winged Wheel logos, as the team used for much of the time prior to the Hockeytown logo. While the logos themselves are enlarged to reflect how a modern center ice is usually filled with paint, I think this still gives a retro feel. I also think that the Winged Wheel is two short and wide to be used across center ice as the team is now doing. I don’t expect the Red Wings to do this, I just think that if they’re changing things up, this is what they should do.